Warning: extra-long bonus post, because: philosophy! After watching the first two episodes of The Good Place, I was underwhelmed. This half-hour NBC comedy—which premiered in 2016 and wrapped up its third season last month—is so odd in premise and tone, it took some getting used to. Three episodes in, however, I joined the throngs of enthusiastic fans and critics. And, it turns out, enthusiastic philosophers. Rolling Stone described The Good Place as “a delicate blend of bright, jokey innocence and deep, brainy pathos.” The brainy pathos arises from the show’s earnest attempt to examine regular people’s moral conditions and decisions with the assistance of the moral philosophical tradition. That’s right: academic philosophy, built into the show’s characters, plot twists, dialogue, and jokes. One minute we’re learning about Kantian ethics, the next we’re noting that a person loses “points” for (gasp) removing both shoes and socks on a commercial airplane. The show makes almost no reference to religious faith, and to me that makes it all the more interesting. Can people improve morally? What makes a bad person or a good person? How do we calculate various levels of badness or goodness? Should we? I find it fascinating to imagine how far we can get in advancing claims about those questions without reference to the divine–although the show has its own bizarre metaphysics. Complications immediately ensue. Lots of complications. You might say, the shrimp really flies (sorry: inside joke). The show is entirely “serialized” and must be watched in order, since its crackling plot line seems to operate on the premise of roughly one eye-popping game-changer per episode. Which is why it’s so difficult to write about without committing ruinous spoilers for potential new fans. Created by Michael Schur (Parks & Recreation, Brooklyn Nine-Nine), the show wins viewers with wonderfully inventive writing, terrific performances, and a good dose of wackiness. But under Schur’s guidance, it also manages the right balance of light tone and serious ethical reflection. We enjoy plenty of jokes about how shallow, nasty, selfish, rude, and stupid people can be—as well as about their terrible taste (clown murals? Red Hot Chili Peppers concerts?). We also ponder sympathetically how difficult it is to struggle with our deepest issues and fears—what one might call, in a theological register, “besetting sins.” Meanwhile, the show champions warmth and human decency, friendship and consideration as morally ameliorative forces. Rather than saying any more and risking spoilers, though, I thought I would get at the show from another angle, by interviewing two real-life, professional moral philosophers who are also fans. I introduce to you Prof. Lindsay Brainard, Assistant Professor of Philosophy at Calvin College, and Keshav Singh, doctoral candidate in philosophy at the University of North Carolina, Chapel Hill. DR: Are philosophers swooning over the show? Do they feel seen and appreciated? L: We certainly do. I’ve only heard positive things from other philosophers about the show, and I’m consistently delighted with how philosophically rich and accurate it is. K: Likewise. It’s one of the only popular depictions of philosophy I’ve seen that includes any mention of contemporary analytic philosophers like Tim Scanlon (more on him below). And I’ve been very impressed that the show’s producers have consulted with real academic philosophers such as Pamela Hieronymi at UCLA. DR: Lindsay, you mentioned to me in an earlier conversation that the show seems to be working roughly chronologically through the history of ethical philosophy. What primary philosophers and schools of philosophy have we seen explored so far? L & K: Things aren’t perfectly chronological, but Chidi first teaches Eleanor about ancient philosophers like Plato and Aristotle and the ethical schools of thought commonly associated with them. Chidi also talks about Hume and his theory of personal identity early in the show. Early on in season 1, we see Chidi reading Kant’s Groundwork of the Metaphysics of Morals, which provides the foundations of Kant’s ethical system. Most interesting perhaps, is the role that Tim Scanlon’s What We Owe To Each Other plays in the show. It’s partly interesting because, while it’s an extremely important book in moral philosophy, it’s probably mostly unknown outside of academic philosophy. Other shows have probably mentioned Plato, Aristotle, Hume, and Kant before, but we’re fairly certain this is the first time a network television show has featured the views of Scanlon or, for that matter, any contemporary analytic philosopher. There are also several mentions of utilitarianism at various points in the show. Utilitarianism is a moral theory according to which actions are right if and only if they bring about the greatest amount of total happiness. Utilitarianism is a consequentialist moral theory, and we think the show is somewhat critical of consequentialism, especially in season 3. We see this in their depiction of the character Doug Forcett. Doug is excelling according to the (consequentialist) points system, but his life is isolated and self-abnegating. Finally, there’s a reference to moral particularism at one point in the show. Moral particularism is a fairly recent ethical theory developed by Jonathan Dancy. According to moral particularism, there are no general moral principles that determine right or wrong. Instead, the moral status of actions depends on the particular features of each situation. This is another example of how The Good Place’s engagement with philosophy is unlike anything we’ve seen before. To our knowledge, no TV show has ever mentioned the work of contemporary analytic philosophers like Scanlon and Dancy before. DR: One episode (2:6) focuses on “the trolley problem,” which has to do with deciding who gets hit by and saved from a speeding trolley. So that’s a thing? L: Not only is it a thing, it’s a whole cottage industry in ethics! (Google “Trolleyology” for an idea of the extent!). The trolley problem was first raised by the British philosopher Philippa Foot in a 1967 paper about a philosophical concept called “the doctrine of double effect.” This doctrine is, roughly, the idea that it is sometimes morally acceptable to knowingly bring about something morally bad as a consequence of doing something morally good, as long as you don’t intend that bad effect. Other philosophers such as Judith Jarvis Thomson and Francis Kamm have explored quite a few ethical concepts using variations of the original trolley case. DR: The show seems to be asking the question: Can a person get better, ethically speaking? What possible answers do you see being offered so far? L: I think the show is optimistic about this prospect! The show is especially optimistic about the effect that studying philosophical ethics can have on a person’s character. The most moral growth that we’ve seen has come from Eleanor, who seems to be internalizing the lessons from her study of philosophy more than the others. Notably, the show seems to be taking a more optimistic view about the impact of studying philosophy on a person’s moral character than many contemporary philosophers espouse. Philosopher Eric Schwitzgebel has published some work that supports a fairly pessimistic view of whether studying ethics tends to make a person morally better (Here is one example.). Whatever might be true about the lives of professional ethicists, I’m certainly optimistic about the value of teaching ethics to college students. K: One thing that’s worth adding is that while Schwitzgebel’s research purports to show that the academic study of ethics doesn’t make people morally better, it doesn’t purport to show that people can’t become morally better in other ways. 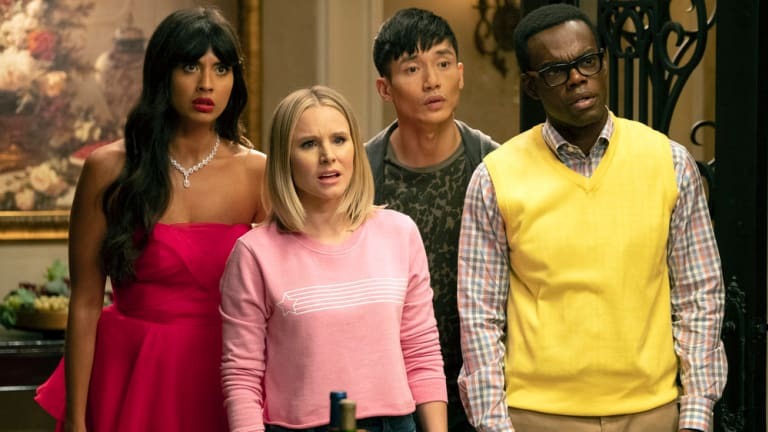 The protagonists of The Good Place get morally better, but there are some differences between their interactions with ethics and academic philosophers’ interactions with ethics. For academic philosophers, interaction with ethics often becomes something purely, well, academic. That can block its transferability to the way we actually live our lives. In fact, this seems to be part of Chidi’s problem at the beginning of the show; he’s very knowledgeable about moral philosophy, but can’t seem to turn that into actually being a good person. Later in the show, on the other hand, Chidi and the other protagonists interact with ethics in a much more practical manner. First of all, they’re not studying ethics so that they can publish papers or get jobs or degrees. They’re studying ethics with the goal of becoming better people; so unlike many academic philosophers, they’re actually actively trying to improve morally. And they get plenty of opportunities to actually practice being better people than they were before. Aristotle and other virtue ethicists thought that such moral practice was essential to becoming a good person, and that abstract reflection on moral principles wasn’t enough. The Good Place’s take on moral improvement seems to fit very well with the idea that it necessarily involves moral practice. DR: Who is your favorite character and why? L: Jason! I find him to be a fun and challenging example, philosophically speaking. Most of my thinking in ethics is influenced by rationalism (specifically, Kantian ethics). This branch of ethics focuses on our ability to discern moral truth by exercising our rationality well. A morally good action flows from our ability to discern the right thing to do through rational reflection. Jason is so fascinating because I see him as a morally good character, but not one that undertakes much rational reflection. He’s perhaps the only human on the show who isn’t motivated by malice, jealousy, or selfish pride. He has a heart of gold, but he’s not exactly a great thinker. His example makes me very sympathetic to other, non-rationalist, ethical systems for evaluating moral worth (like virtue ethics and the ethics of care). K: I enjoy all of the main characters in the show and find it difficult to decide on a favorite. But I probably identify most with Chidi, not least because of my indecisiveness and tendency to overdeliberate. Like Chidi, I often agonize over relatively inconsequential things because I’m worried about getting them exactly right. This is a kind of stereotype about philosophers, and while I don’t know whether it’s overblown or not, I know I’m not the only real-life philosopher who suffers from this problem. And while Chidi is an extreme example, it’s not exactly surprising for a philosopher to be like this, since agonizing about getting things exactly right is a lot of what philosophers do, and that’s likely to bleed into other areas of life. DR: The point system is a great source of jokes, but now it’s getting more complicated. Is a point system a neat way to encapsulate moral thinking or does it limit the show’s capacity for reflection? K: I don’t think the point system is a good way to encapsulate moral thinking, but I also don’t think that limits the show’s capacity for reflection. My sense is that as the show has gone on, it’s actually become quite critical of the points system. The seeming injustice of the points system suggests that despite its being the way that the powers-that-be determine who gets into the good place and who gets into the bad place, it’s not actually tracking moral reality. The closest ethical theory is called consequentialism. According to consequentialism, actions are morally right if and only if they bring about the best consequences. In particular, the point system is closest to a view called scalar consequentialism, according to which the overall moral verdicts about actions are all scalar; actions are better (or righter, if you will) to the extent that they bring about better consequences than alternatives. But it bears repeating that most contemporary consequentialist theories are fairly sophisticated, and their defenders would probably not endorse the way the show’s point system works. Even so, the idea that in order to determine how morally good a person’s life has been, we just calculate the net goodness produced by all of their actions, is most congenial to a consequentialist approach. I myself am unsympathetic to consequentialism. I’m tempted to say that the show’s critique of the point system suggests that the show is also critical of consequentialism, but I may be reading my own views into the show. DR: What do think will happen next? What do you want to happen next, at least in terms of moral issues addressed? K: I have no idea what will happen next. There are so many twists in the show that it’s truly unpredictable. In terms of moral issues addressed, I’d like to see the show explore a philosophical issue called the demandingness problem, which is often posed as an objection to consequentialism. The demandingness problem basically says that any moral theory that is unfairly demanding with regard to what it requires out of ordinary moral agents like us can’t be the correct moral theory. In the show, Michael’s crusade against the point system (in season 3) suggests something similar: the point system is unfairly demanding, so it can’t be tracking moral reality. I’d love to see some more exploration of that. L: I’d love to see the show tackle the issue of moral luck. That is, I’d like the show to consider the role that luck plays in how morally good or bad our lives turn out to be. We’re not all born with equally good temperaments or into equally good circumstances. We get lucky, or unlucky, morally. The philosopher Bernard Williams introduced the term “moral luck,” and other philosophers (such as Thomas Nagel and Susan Wolf) have written wonderfully about the depth of the puzzle. I’d love to see this work reflected in a plotline on The Good Place, and I think there’s ample opportunity in the coming season. DR: Favorite moment? Favorite joke? L: I laughed the hardest at the explanation of how time works in the afterlife. In my introductory philosophy course, I teach a unit on the metaphysics of time, and I can’t wait to show the Jeremy Bearimy clip. It will actually tie in quite nicely to some of my course content. Many thanks to Lindsay and Keshav for their time and wisdom.